Josh Eichorn: found that, despite the offhand remarks he’d heard in the shower, he needed more than just an ammunition belt and his own body hair to pull off an effective Chewbacca disguise for Halloween. She-Dragon is once more begged by Angel to join the fight against Universo but is informed that the best they can likely do at this points is pray. Dragon had managed to shield Ann Stevens when Universo brought his fist down on top of them and the force of the impact knocked her wrists together, transforming her back into Mighty Man. The cosmic entity drains their energy in addition to that of the Earth’s as the media watch on. The rest of the heroes and Mother Mayhem remain unconscious as Dragon manages to release Mighty Man, screaming for him to wake up. All looks lost until Solar Man swoops down seemingly out of nowhere and strikes out at Universo, knocking back his opponent. The whole world watches on as Solar Man repeatedly strikes out at Universo and manages to break open his outer shell. This reveals that Universo is actually a being of pure energy which Solar Man deals with by spinning near him at super-speed. The resulting tornado scatters Universo’s atoms away so that they can never reform. Mother Mayhem had attempted to aid her master but Dragon kept her busy long enough for Solar Man to deal with Universo. He then turns his attention to his victim’s herald, punching her away from Dragon. A warning is issued regarding the Devourer of Worlds’ death as he had eliminated countless arrogant and dangerous alien races that had threatened all existence and now there is nothing to stop such species from causing mayhem. Solar Man has had enough of her speech and he unleashes his powerful heat vision that completely incinerates Mother Mayhem. 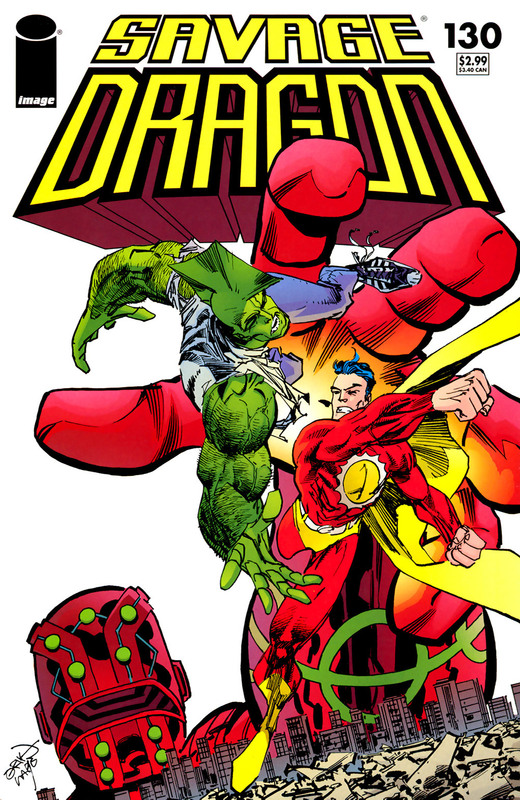 Dragon questions the need for lethal force as Mother Mayhem was clearly defeated but Solar Man defends his actions. He points out that had Dragon finished Universo and Mother Mayhem off the first time they attacked then this whole event could have been avoided. Solar Man then punches Dragon to the ground before departing to prevent the government’s air strike from being carried out. With Solar Man gone, Dragon asks his friends about this man’s identity. SuperPatriot recites some of the history of this death-dealing hero, pointing out how Sgt. Marvel wished him out of existence with the God Gun when he started killing criminals and then anyone that disagreed with him. Dragon is interviewed about recent events and the reporters blame him for Mister Glum’s reign due to him having ignored warnings about how dangerous Glum could be. Dragon defends his actions but SuperPatriot advises him to move on as the reporters are correct, if he had dealt with Glum when others had said then the Earth never would have been conquered. Wally arrives on the scene with Roxanne Wells. He had been asked by Vanguard to locate is girlfriend as he had been worried that she had been harmed during Glum’s rule. The couple are reunited as Dragon is reunited with Angel and She-Dragon. After heading to the Rock House Diner to rest, Dragon finally learns that Angel is actually his step-daughter from his original reality. She explains how Debbie Harris had read Damien DarkLord’s mind and discovered that Universo was coming to Earth. A group of kids went with Debbie to recruit the aid of Rex Dexter in reaching Dragon so that he could come back and help them out. This plan ended up failing and the survivors ended up stranded in Dimension-X with WildStar and his friends. The news that his son may have survived the destruction of his original Earth makes Dragon happy and he ignores any warnings that Malcolm may have died when the planet they were all on was eaten. He hopes to return to Dimension-X to retrieve his son but also hopes that he can finally locate his wife. Alex Wilde arrives at the diner to collect the group as she has offered Dragon, Angel and She-Dragon a place to stay at her apartment for the time being. A bank robbery is occurring in Detroit, Michigan draws the attention of the Deadly Duo when they hear that the criminals involved are using their name. Kill-Cat is enraged that their reputation is being endangered by two thieves and leads the Kid Avenger into battle. They enter the bank where police officers claim to have the situation under control. The Deadly Duo is surprised to find only one villain inside, a super-freak who can fire missiles from her breasts. Kill-Cat ignores the police’s words and attacks regardless, swiftly getting blasted out of the bank by one of the missiles. This new Deadly Duo proves to be a formidable opponent but the Kid Avenger uses his battle-suit to short out the mechanical controls of her chest harness. The villain is unable to fire off any more missiles and is soon knocked out by the hero. The police take the Deadly Duo into custody and the officers thank the Kid Avenger for his assistance, promising to pass on his good work to the mayor. The Kid Avenger reports his victory to a recovering Kill-Cat who is quick to claim some of the glory for himself. He announces that this is another win for the true Deadly Duo and celebrates.